* This product comes with a limited warranty that is valid only if purchased from a NETGEAR authorized reseller, and modifications to product may void the warranty; covers hardware, fans, and internal power supplies—not software or external power supplies; see http://www.netgear.com/about/warranty/ for details. ** The NETGEAR OnCall 24x7 contract provides unlimited phone, chat and email technical support for your networking product. Rackmount or Desktop Flexible deployment in standard 19” rack using the included rackmount kit or on desktop using included rubber feet. 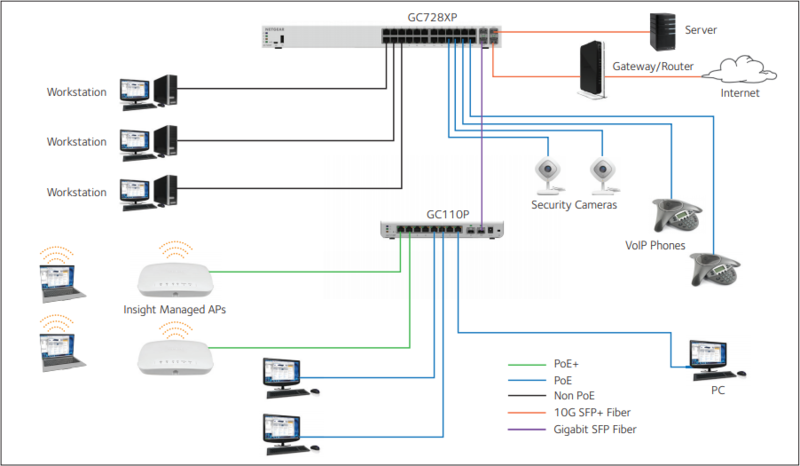 Robust Security Features (802.1x, ACLs, MAC Authentication) Build a secured, converged network with all types of traffic by preventing external attacks and blocking malware while allowing secure access for authorized users. 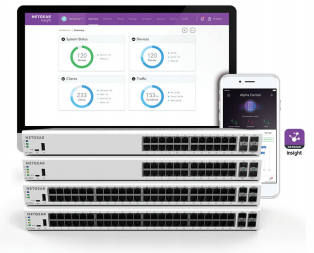 NETGEAR is revolutionizing unified, centralized network management with it’s new line of Insight Managed Smart Cloud Switches and Wireless Access Points, all managed from the palm of your hand, anytime, anywhere, on your phone or tablet using the NETGEAR Insight mobile app. Or, for a larger screen experience, from your PC, Mac, or tablet web browser using the Insight Cloud Portal. Know immediately if and when your network is not running perfectly; not after you’ve already lost business or suffered significant down-time.